Why are these USB data lines conned to pull-up resistors? I recently got a car lighter to USB adapter which I planned to use to charge my mobile phone. Unfortunately, the phone won't charge (and I know that the phone is capable of charging over USB port), so I opened it to see what could be the reason. The charger itself is pretty simple. It has a rectifier, MC34063A regulator and needed components, an LED and resistor and USB port. Of particular interest to me was the USB port itself. 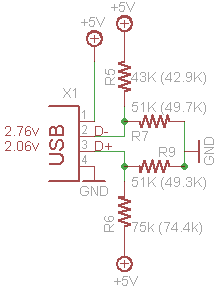 If I remember correctly, for USB chargers, there should be a 220Ω resistor between data lines to signal to the device that the host is a charger. I used black rectangles to mark junctions. So if I'm reading this correctly, the D- and D+ lines are connected via pull-up resistors to Vcc. I'm thinking of removing these resistors and putting a 220Ω resistor between the data lines. Is there any obvious reason why should the data lines be connected to Vcc through this complicated system of resistors? Is there any reason why I shouldn't remove those resistors and just put a 220Ω resistor between the data lines? If I am not getting confused, this system of resistors is required by iPhones and other i-Devices to charge at different current levels. Otherwise an error message will pop up. If you don't have an iPhone you can quite safely remove these and replace them. Apple stopped being as 'lax' with the charging interface and started being very picky about having the official chargers. We still doubted that there was an enumeration chip inside each charger - too expensive and complex. So there must be something else going on in those data lines. Time to sacrifice an official Apple iPhone 3Gs charger! The resistors aren't really complicated, it's a simple Voltage Divider. 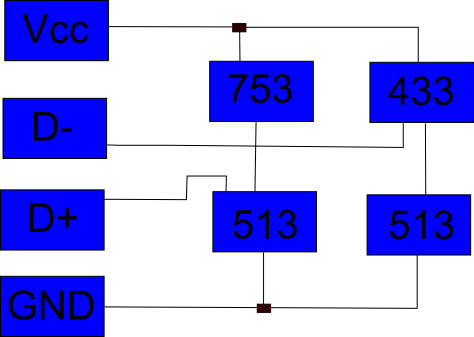 It's meant to take the voltage difference between Vcc and GND, and divide it to some particular voltage for the D+ and D- lines. Thomas O is correct in saying this is to support Apple products but there are some other devices that use a similar, sometimes slightly conflicting, set up to determine if the devices is a charger. In essence this is a hack to avoid putting a USB enumerator in charging devices. The enumerator is used to make a device act as Host. It negotiates current requirements and capabilities between a host and device to ensure compatibility, announces the device's successful connection to the host, etc. The strict USB spec states that a device should connect at some very low current draw - enough to power its own logic - and negotiate for more current. This is overkill for a simple charger since there is no need to ever care about real data or communication. Some industry people decided to put in some "dumb" settings to allow a device to detect a connection to a simple charger, determine what current it is safe to draw and react all on its own without instruction. There are a couple places to find what the voltages should be to specify, say, 100mA, 250mA, 500mA or 1000mA capability. If you decide to modify your charger, make sure you know exactly what the safe output current is and that you're not advertising more capability than you can provide. This could cause your charger to fail in unexpected ways and possibly damage your connected device. Or it might just melt the plastic and release awful fumes. Not the answer you're looking for? Browse other questions tagged usb charger or ask your own question. Is it safe to use the cable used in Portable Battery Charger and connect to the phone via the PC USB? How to test if the USB data lines are being passed to the port?